Pirates were basically the world's first hipsters. Don't scoff, think about it! Exhibit A: Pirates and hipsters both love beards. In fact, more than that they both love unusual hairstyles in general. Do they even keep razors on pirate ships? 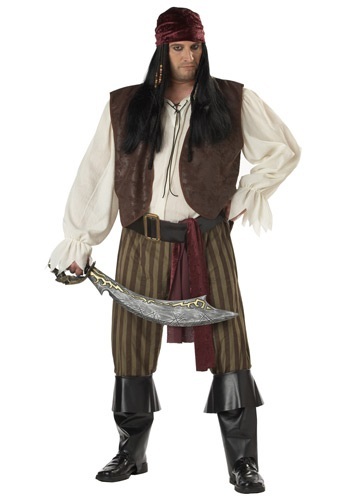 Exhibit B: Pirates and hipsters both stick up their noses to the status quo. Try to make them live a life of lawfulness? Ha! Pirates laugh at that before they make you walk the plank. Try to give a hipster some meat? Ha! Hipsters laugh at that before they make you listen to all the reasons they're vegan (the plank is preferable!). Are you seeing the connection here? Exhibit C: Those clothes! What kind of fashion is that, with the sashes and the puffy shirts? Pirate fashion! But also, wait for it... Hipster fashion! Are we blowing your mind yet? You can say yes. The next time you're walking down the street of some trendy neighborhood in New York or Los Angeles or wherever it is hipsters call home, you'll pass by a wood and steel coffee shop. At least you assume it's a coffee shop, but you can't be sure because there aren't many places to sit and everyone seems to be wearing pirate clothes. And then you'll start to panic, thinking you've fallen through a hole in time and you're back in the 1600s, about to be fed to sharks. Don't worry, friend. You're just in the presence of hipsters. So don this costume and blend in with ease!